A VPN or a Virtual Private Network is a service that helps keep your identity and online activities private from prying eyes and hackers over the Internet. 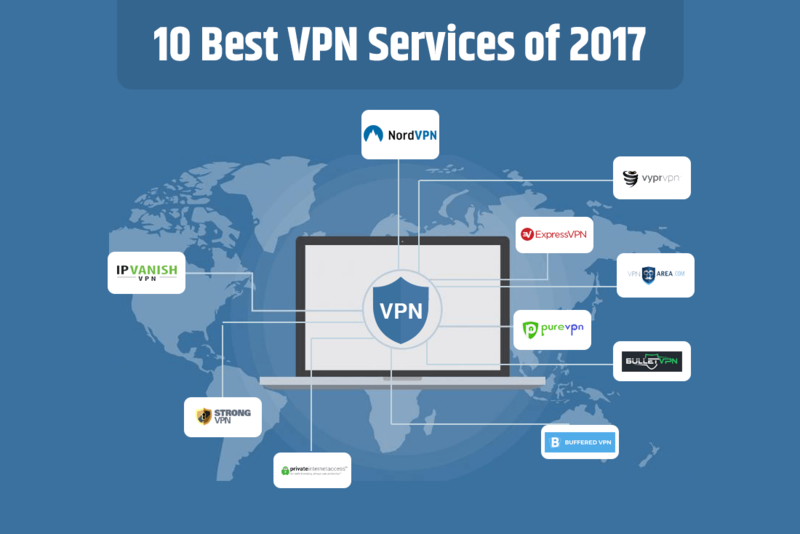 In this post, we have covered our 10 best VPN services for 2017 with their reviews to help you pick the best. From the perspective of security, using a VPN is of great importance. Don’t take your online security for granted and install a secure VPN that’ll shield you from anonymous attacks and many cyber attacks such as data theft and virus attacks to name a few. A VPN will hide your IP address and act as a shield from malicious hackers. Need I say more? In the world where everything is just only one google away, protecting your privacy is of great essence. Stay secure and browse the Internet in a private manner with a VPN backing your router. Some torrents, websites and media content is restricted due to geo-restrictions and ISP throttling. However, with a VPN service you’ll be able to circumvent all these limitations and enjoy anonymous torrenting or streaming otherwise restricted media content easily. As an example have you ever used a media service like Kodi? Many add-ons on Kodi are blocked due to ISP restrictions. However with a best Kodi VPN on your system, you can bypass it all. You wanted to know the reasons and it was fair enough. Now that you know the great need and benefits of a VPN service, let’s get into the curated list of top rated VPN services of 2017. IPVanish is one of the most popular VPN recommended by top sites and blogs over the Internet. With this Tier-1 best VPN provider you’ll have access to 40,000+ shared IPs, 850+ VPN servers in 60+ countries. Apart from being the world’s largest and fastest VPN, you are also safe from prying eyes with IPVanish zero log policy. This means no traces of your browsing history is ever recorded by IPVanish. With less than $7, you can connect 5 devices simultaneously over the best VPN provider in the market. Also, unlimited bandwidth means faster network speed and encryption of sensitive data with 256-bit Encryption. Multiple VPN protocols like OpenVPN, PPTP and L2TP/IPsec VPN protocols help to make IPVanish more powerful and adaptable across all devices. Unlimited Server Switching, 24/7 customer care support and 7 day Money-back Guarantee are some other features that make IPVanish the best VPN service of 2017. Get IPVanish at maximum discount here. PureVPN is another user-friendly and powerful VPN service with an access to over 500+ servers and a Smart DNS feature. If you’re a frequent Chinese websites visitor, PureVPN is an ideal choice as it is one of the rare VPN services that can circumvent Mainland China. Other notable features include Automatic Kill switch and DDoS protection. This proxy server is available and compatible with most devices and has a great user-friendly interface. You can safely try PureVPN with a 7 Day Money Back Guarantee and a 24/7 Live customer care support at your service. > P2P support on select servers. With NordVPN, you can be rest assured about your privacy as this top rated VPN service comes with a DoubleVPN feature. This feature generates two layers of security for encrypting your data. A strong global footprint with 534 servers in 47+ countries and a connection support of 6 devices simultaneously ranks this best VPN service on number 3 on our best VPN list. The reliability factor also remains unquestionable for NordVPN because of its strong protocol suite. Installation is also quick and quite easy to understand with a user-friendly interface. Get NordVPN for one-month on a trial period and experience the multiple security features yourself. With a secure blanket of 30 days Money Back Guarantee, you may give ExpressVPN service a go. With servers spread across 145+ countries, multiplatform support and unlimited bandwidth, this VPN provider is a fairly good choice. Access censored sites and media content on Netflix and BBC and switch server innumerable times only with ExpressVPN. However, it may be noted that with just 3 devices connection support, this VPN service is priced at little on the higher side. > Few hiccups with Windows 10 users. If you own an older OS, PIA will most likely work on that as well. One of the oldest and most reliable VPN service provider, PIA has more than 3000 servers in 24 countries. This best VPN service also offers protection from IPv6 leakage and blocks irrelevant and annoying snooping by advertisers, big data collectors and personal information access over the Internet. Offering simultaneous login from 5 devices with a cross-platform support and instant setup, I would highly recommend this VPN. Owning more than 700 servers in 70+ countries and having a NAT firewall, VyprVPN boasts multiple features and is considered as one of the best VPN services of 2017. Using advanced VPN protocols and Cloud VPN, this VPN also includes add-ons for expanded security and extremely fast browsing speed. Another noteworthy feature is unmodified OpenVPN 256-bit protocol inclusion that prevents VPN blocking. A free trial version of VyprVPN is also available. > Additional VPN add-ons available. Awarded as the best VPN service of 2017 by bestvpn.com, VPNArea keeps the malicious intruders away and your sensitive information secure using unbreakable 256-bit encryption scheme. Having a vast VPN network with shared IP servers across 60+ countries, this top rated VPN service is known for its high speed and better browsing experience. Also, it checks how busy a server is before connecting with “Server load monitor” to ensure unlimited bandwidth and a stable VPN service at all times. Automatic IP switch ensures improved connectivity over 6 simultaneously connected devices. Buffered is another top VPN service provider known primarily for its fast connectivity and speed for streaming Live media over the Internet. With 33+ and more servers being added on request, Buffered is quick and easy to install. Also offering a 30 day money back guarantee, Buffered offers fastest connectivity with UK servers. This VPN service also provides prevention from DNS leakage and keeps no tracks with its zero logging policy. However, you must consider that this VPN service provider isn’t compatible with many old version of Operating system. So, before you make the purchase, just do a quick hardware compatibility test with this most popular VPN. Just like its name, this best VPN service of 2017 offers lightning-speed browsing and downloading over the web. Also featuring a user-friendly app, this VPN service provider keeps no track of your browsing history and allows unlimited server switches. More so, if you’re unsatisfied, no worries! BulletVPN comes with a 30 Days Money Back guarantee. It also keeps your data secure with industry standard protocols for high level of encryption. Not to forget, you also get unlimited bandwidth with multiple servers around the globe. A U.S. based VPN service provider with its own DNS servers promises to provide users a safe browsing experience. Having 600 servers in 20+ countries, StrongVPN offers two highlight features. First being, automatic Kill Switch that shuts off all apps on disconnection from VPN. Second feature is scrambling which includes an additional layer of security displaying normal Internet traffic when connected to VPN. Supporting all major platforms this VPN shows disappointment with only 2 devices connection support at a given time. VPN is a must-have necessary software that keeps your data and identity secure from cyber attacks and malicious hackers with strong protocols and encryption schemes. While all these VPN services are rated as most popular and top notch, our personal recommendation would be IPVanish VPN service. This VPN service ranks on #1 position because of the largest VPN network it owns and a variety of additional features it offers at a meager price of $6.49 per month. If you found this article useful, share it with your friends and family to spread the benefits and necessity of a VPN in their life.